Documenter is part of the second generation GToolkit project, it is based on Bloc and works with the latest Pillar. It is mainly developed by Juraj Kubelka. The document shows a method on top, and a change preview at the bottom showing both the code and the associated diff to the state from the image. Applying the change updates both the change view (no more diff), and method preview. This speeds up significantly the process of going through a tutorial. Furthermore, given that now the document shows the diff to the current image, the reader can safely explore alternative scenario and come back to the tutorial at any time without losing the overview. IceRepository repositoriesLocation / 'feenkcom'/ 'gtoolkit-examples' / 'doc' / 'tutorial' / 'examples-tutorial.pillar’. • the execution of code shows an embedded inspector. IceRepository repositoriesLocation / 'feenkcom'/ 'gtoolkit' / 'doc' / 'gtoolkit' / 'gtoolkit.pillar'. As always, please do let us know what you think. Guys this is really impressive! 2) In a clean 6.1 image I get a walkback (GtPhlowExplicitView>>mondrian DNU) when you try any of the graphical bits , making me think either the dependencies are incorrect on the Baseline (or the instruction for the example also need to mention you need to load something else - presumably Roassal? About the next steps: We mostly think in terms of the overall goal, and the concrete next steps somehow happen. For us the end goal is a moldable environment that integrates all workflows related to development. Documentation is one of those development activities that are both pervasive and typically disliked, so it is only natural that we want to aim to create a full experience for it within the environment. What is more interesting to us is that we could create this experience without much effort due to the flexibility of the underlying framework. There is still engineering work to do, but I think the most difficult part is to rethink the way we approach UI given these new abilities. > This is super impressive. > Documenter is part of the second generation GToolkit project, it is based on Bloc and works with the latest Pillar. It is mainly developed by Juraj Kubelka. > GtDocumenter editorForText: BrToggleExamples comment. > The document shows a method on top, and a change preview at the bottom showing both the code and the associated diff to the state from the image. Applying the change updates both the change view (no more diff), and method preview. This speeds up significantly the process of going through a tutorial. Furthermore, given that now the document shows the diff to the current image, the reader can safely explore alternative scenario and come back to the tutorial at any time without losing the overview. > IceRepository repositoriesLocation / 'feenkcom'/ 'gtoolkit-examples' / 'doc' / 'tutorial' / 'examples-tutorial.pillar’. 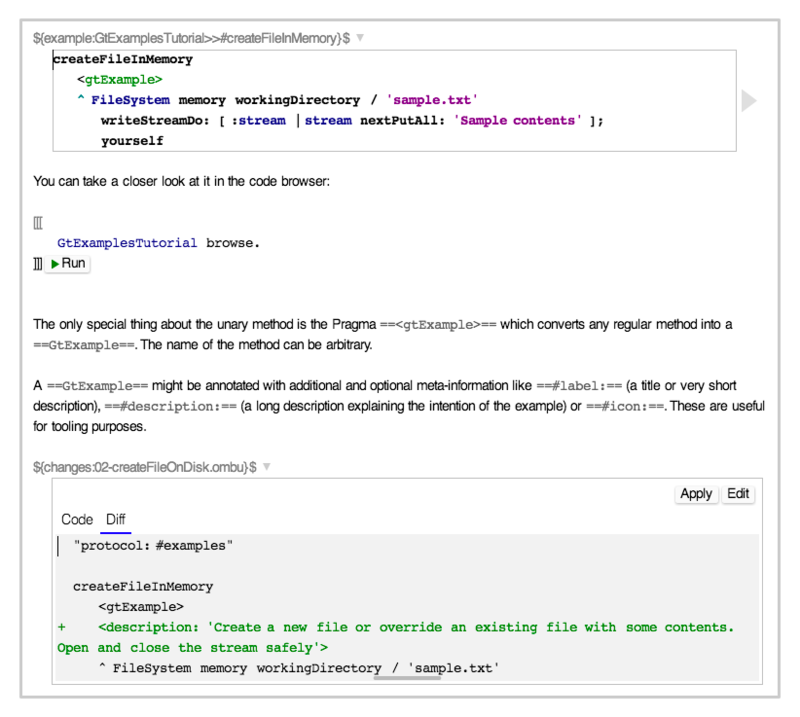 > • the execution of code shows an embedded inspector. > IceRepository repositoriesLocation / 'feenkcom'/ 'gtoolkit' / 'doc' / 'gtoolkit' / 'gtoolkit.pillar'. > As always, please do let us know what you think. > Guys this is really impressive! > 2) In a clean 6.1 image I get a walkback (GtPhlowExplicitView>>mondrian DNU) when you try any of the graphical bits , making me think either the dependencies are incorrect on the Baseline (or the instruction for the example also need to mention you need to load something else - presumably Roassal? Indeed, this is due to the fact that loading GToolkitDocumenter does not load GToolkitVisualizer which includes GtMondrian. We are still working on finding the right dependencies balance. Until then, please load the whole GToolkit to get the full support. >> Documenter is part of the second generation GToolkit project, it is based on Bloc and works with the latest Pillar. It is mainly developed by Juraj Kubelka. >> GtDocumenter editorForText: BrToggleExamples comment. >> The document shows a method on top, and a change preview at the bottom showing both the code and the associated diff to the state from the image. Applying the change updates both the change view (no more diff), and method preview. This speeds up significantly the process of going through a tutorial. Furthermore, given that now the document shows the diff to the current image, the reader can safely explore alternative scenario and come back to the tutorial at any time without losing the overview. >> IceRepository repositoriesLocation / 'feenkcom'/ 'gtoolkit-examples' / 'doc' / 'tutorial' / 'examples-tutorial.pillar’. >> • the execution of code shows an embedded inspector. >> IceRepository repositoriesLocation / 'feenkcom'/ 'gtoolkit' / 'doc' / 'gtoolkit' / 'gtoolkit.pillar'. >> As always, please do let us know what you think. you will end up with a messy haircut."